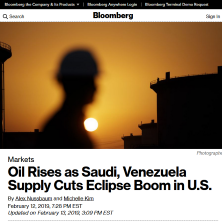 Oil Rises as Saudi, Venezuela Supply Cuts Eclipse Boom in U.S.
Oil climbed for a second day as dwindling shipments from two of the world’s biggest crude exporters eclipsed another big jump in U.S. supplies. Futures in New York closed up 1.5 percent, reaching the highest point in a week. The rally came as the International Energy Agency warned that turmoil in Venezuela could disrupt global flows of heavy crude and after Saudi Arabia said it would extend its own cuts. A U.S. Energy Department report showed higher-than-expected domestic inventories but plummeting imports. Oil has advanced around 19 percent this year as the OPEC+ alliance of producers cut output, but the rally has sputtered in February amid record U.S. shale drilling. In another bullish sign this week, President Donald Trump struck a conciliatory tone on trade talks with China, suggesting higher tariffs might be averted. West Texas Intermediate crude for March delivery gained 80 cents to $53.90 a barrel on the New York Mercantile Exchange, for its highest close since Feb. 6. Brent for April settlement advanced $1.19 to $63.61 a barrel on the London-based ICE Futures Europe exchange. The global crude benchmark traded at a $9.30 premium to WTI. In the U.S., oil inventories climbed 3.63 million barrels, while supplies of gasoline, heating oil and other fuels added about 3 million barrels more, according to weekly data from the Energy Information Administration. At least part of that buildup reflected weather problems and seasonal maintenance at refineries, said Matt Sallee, a portfolio manager at Kansas-based Tortoise. Total crude imports hit their lowest since 1997, curbed by Saudi Arabia’s move to cut supplies and American sanctions that have forced the same fate on Venezuela.